This image from the High Resolution Imaging Science Experiment on NASA's Mars Reconnaissance Orbiter shows "Victoria Crater," an impact crater at Meridiani Planum, near the equator of Mars. NASA'snewest Mars orbiter has spied the plucky rover Opportunity perchedat the rim of the red planet's massive Victoria Crater as both vehicles explorethe fourth planet from the Sun. Appearingalmost as a shiny boulder, Opportunity's lumpy outline and its camera mast shadow can easily beseen in a high-resolution image of Victoria Crater taken by NASA's MarsReconnaissance Orbiter (MRO) and released by the space agency onFriday. "It is sogood to see that rover again," said Steve Squyres, the lead Mars ExplorationRover scientist from Cornell University in Ithaca, New York, during a pressbriefing. "I've got to say that image with that little rover 200 million milesaway, parked at the top of that cliff, that's just one of the most evocative imagesI've ever seen in the planetary program...it's just beautiful." At half amile wide (0.8 kilometers) and 200 feet (60 meters) deep, VictoriaCrater is large enough to fit up to five football stadiums inside and isthe biggest Martian crater to be visited by NASA's red planet rovers, missionmanagers said. "It'sprobably the biggest crater we're ever going to get to with Opportunity, or infact with Spirit," NASA's Mars exploration program director Doug McQuistionsaid during the briefing. "The bottom line is it gives us a window on the past ofthe planet, and that's incredibly important to understanding why it is the wayit is and understanding relationships to potentially other rocky planets in theSolar System." Opportunity hasspent 21 Earth months exploring the Meridiani Planum region of Mars, eventuallyworking its way from its initial Eagle Crater landing site to Victoria. Therover's robotic twin Spirit rolledacross its own Gusev Crater landing site, scaledone of the region's Columbia Hills and clambereddown the other side. Together, the two rovers have produced some 160,000images of the red planet. "I think thewhole Mars Exploration Rover program is an example of NASA at its best," NASAchief Michael Griffin said during the briefing today at the agency's WashingtonD.C. headquarters. The MROspacecraft's High-ResolutionImaging Science Experiment (HiRISE) camera spotted Opportunity perched atopa region known as Duck Bay at Victoria Crater during an Oct. 3 pass, whenmission controllers conducted the first test to physically aim the low-altitudespacecraft at a specific target on Mars from an altitude of about 170 miles(275 kilometers). "We haven'teven begun the prime mission yet, that starts in November," said Alfred McEwen, MRO'sHiRISE principal investigator at the University of Arizona. NASA launchedthe MRO orbiter in August 2005 and the probe arrivedat the red planet last March. NASA released thefirst images from HiRISE, the largest telescopic camera ever sent toanother world, on Sept. 29. But MRO's VictoriaCrater images have already proved fruitful for Opportunity handlers, who areeager to probe deep within the depression to get at the ancient layered rocks revealedon outcrops and protrusions along the crater's wall. "We'reextremely excited to see changes in the layering that we see in the outcrops,because changes in layering mean changes in the environment," Jim Bell, leadscientist for Opportunity's panoramic camera, said during the briefing. Earlyestimates pin Victoria Crater at somewhere between 10 million and 100 millionyears old, but the rocks within the depression themselves are likely much older- as in a few billion years in age, researchers said. Since the crater is alsomuch deeper than any explored by Opportunity to date, the rover has anunprecedented chance to uncover secrets of the region's distant past, theyadded. "For me,this week has sort of felt like opening a book, like a mystery novel, where youread the first few pages and you're hooked," Bell said. "We've just opened thebook on the story of Victoria Crater at Mars." Opportunityhas already foundevidence that subsurface water once soaked rocks at Meridiani Planum basedon studies at Eagle Crater and the larger EnduranceCrater, both of which are dwarfed by Victoria's size. Squyressaid rover planners used MRO imagery as they planned Opportunity's short tripfrom Duck Bay to a nearby bluff dubbed "Cape Verde" by mission team members. VictoriaCrater itself borrows its name from the single surviving ship - of a fleetof five - of the historic Magellan expedition to circumnavigate the Earth inthe 16th century. 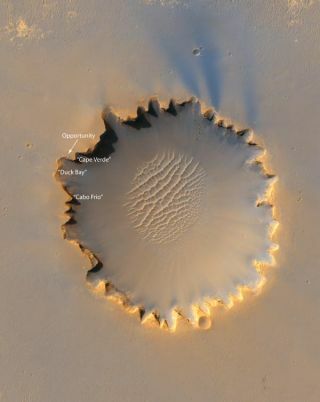 MRO'sdetailed portrait of Victoria Crater, combined with panoramic images taken by Opportunity, will be the foundation from which Squyresand his team shape the rover's partial trek around the depression's rim and,eventually, the descent into the crater itself. A completetrip around the crater's 1.5-mile (2.5-kilometer) rim would take up to ninemonths, and is likely unnecessary to obtain the needed data, mission managerssaid, though a small crater named Sputnik just 60 feet (18 meters) is anattractive target too. "What we wantto do is find a safe path in and a safe path out...we don't want to make asuicide dive into the crater," Squyres said. "We're going to do this safely, we'regoing to do it carefully, we're going to do it when we're ready." Roverhandlers must now balance safety with aggressive driving to get the mostscience from what life Opportunity has left, Squyres added. Opportunity is now into the 960th Martian day of a mission thatwas initially planned to span just 90 sols, the term for days on Mars. Now pushingmore than 10 times its expected lifetime, Opportunity could fail at any moment, and Squyres attributed the rover's longevity to a robust design and adepthandling by mission engineers and managers. "You reallyhave to respect this landscape because it is a potentially very, very dangerousplace for the rover," Bell said. "We have goo-goo eyes about the potential ofwhat we can do, but we have to be very, very cautious."